360°Swivel Bass Seat with Adjustable Height Power Pedestal Seat Mount 20"-30"
Swivels with gas lift runners for silent, smooth 360° rotation. Height Adjustable with a gas lift between 19.9” and 30”. The seat is manufactured from durable high-impact moulded plastic. 2 Navy Gray High Back Boat Seats Folding Seat For Fishing Pontoon & Bass Boats. 2 Navy Gray High Back Boat Seats Folding Seat For Fishing Pontoon & Bass Boats. These Boat Seats have a heavy-duty marine-grade vinyl cover that's mildew-resistant and UV-treated. Compatible with most boats and seat mounts. This Low-Back Boat Seat is made of vinyl and features EVA padding. The seat also folds for simple storage between uses. Replaces or upgrades the seating on your boat. Lund Grey Bike Seat - NEW! It has 4 mounting holes in the base that are a universal fit for most marine pedestals. Looking for a different Lund seat?. If not listed, we have access to several other current Lund seats! NEW LUND GREY BIKE SEAT. 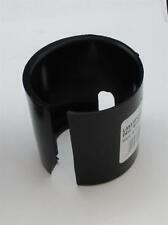 Boat part number 1062824 is a new, in the box, boat hi-low seat pedestal kit from Coast, part number SW23205. Part Number: SW23205. 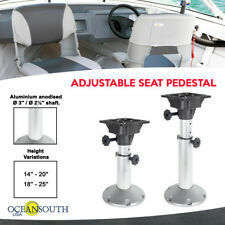 This silver aluminum hi-low seat pedestal kit fits most boats seats / hole patterns. Adjustable boat seat pedestal is designed to support and attach a boat chair to the floorboard, great for adding new seating or replacing the existing chairs. Each seat pedestal features (4) height positions at 11.75", 13.75", 15.75" and 17.75" with locking pin to hold it at the desired height. 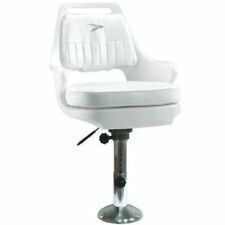 8" Marine Boat Seat Pedestal with 360 Degree Swivel. This 8" height Pedestal with Swivel Seat Boat has a solid black coating with 6 3/8" (162mm) x 6 3/8" (162mm) square base and seat mount. Rugged, all steel construction, E-coat finish resisting corrosion and all-weather conditions. Folding Boat Seats x 2. Boat Seats. Deluxe seats will suit any type of boat you may have. Sail Boat Awnings. Boat Seat Cover. Deluxe – folding seats White. Deluxe – folding seats Grey. Deluxe – folding seats Blue/White. Perfect for marines seats or barstool or your DIY chair projects. 1 x Seat Swivel Base. Self-lubricated, non-corrosive, poly swivel bearing heavily plated steel to resist corrosion. Black finished, Heavy duty powder coated steel. Springfield part #3620402-P. Features: •Manufacturer: Springfield. •3/4" pin works with all Springfield Marine Kingpin Bases. •Class B (designed for occupancy only at boat speeds not exceeding five miles per hour). This is a 2018 / 2019 Lund Standard Seat. The seat pedestal and pole are not included in the price. This seat will work on all standard marine seat mounts. Pair of Attwood 16" boat seat extensions. These fit 3/4" seat mounts, these have threaded bases if you want to lock them in. You are getting exactly what is pictured. ✓ UV-treated ✓ Mildew Resistant ✓ 30-Day Free Returns! Zinc plated steel, 3 Degree Tilt, 2-3/4" steel pin, with spring. Zinc plated steel. 3 degree tilt with spring. Made of aluminum, it is sturdy and durable. Cruise and cast in comfort! These Guide Gear Boat Seats have a heavy-duty marine-grade vinyl cover that's mildew-resistant and UV-treated. And they're comfortable, too. Get on-board with this High-Back Folding Boat Seat! Adjustable Padded Deluxe Kayak Seat Detachable Back Backpack/Bag Canoe Backrest This is an adjustable padded kayak seat with a detachable back pack/ bag on the back of the seat. This seat is suitable for most kayaks and canoes and this is for sit-on-top kayak paddlers. This high quality kayak seat gives paddlers a comfortable kayaking experience. The detachable back pack is able to store most of the kayak accessories or lunch boxes. Steel pin. We're your port for thousands of hard to find boat parts, original manufacturer's parts and marine surplus. Check out this deal! Fixed Height. 25" Threaded with 9 3/4" long Pin. Don't live in the US or Canada?No need to feel left out. Boat seat swivel. 360-Degree ball-bearing seat swivels with a 5-1/4" universal mounting hole pattern. 1 x Seat Swivel Base. Perfect for marines seats or barstool or your DIY chair projects. Self-lubricated, non-corrosive, poly swivel bearing heavily plated steel to resist corrosion. 6 1/4" x 6 1/4" x 7/8" thick. At checkout, choose the one best for you. Motorcycle / ATV / Boat Upholstery Marine Vinyl in 17 COLORS (per yard). 2 Folding High Back Boat Seats Red & Gray Pontoon Bass Fishing Boating Seat New. Cruise and cast in comfort! These Boat Seats have a heavy-duty marine-grade vinyl cover that's mildew-resistant and UV-treated. 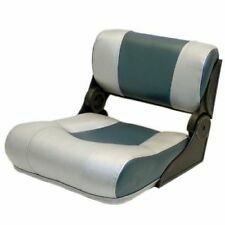 2 Gray Boat Seats With Swivels Folding High Back UV Treated Marine Vinyl Seat . These Boat Seats have a heavy-duty marine-grade vinyl cover that's mildew-resistant and UV-treated. Has (8) mounting holes in the platform, designed to fit 5" x 5" and 12" x 5" mounting patterns. Slide has roughly 4 1/2" of travel. Roto Molded Chair, Snap-On Cushion Set and Mounting Plate. Marine grade vinyl is loaded with UV and mildew inhibitors. High compression foam padding. It says it all. Trending at $71.03eBay determines this price through a machine learned model of the product's sale prices within the last 90 days. Very gently used swivel and three seat mounts. The seat mounts are taken from new seats. attwood 17720 Boat Seat Swivel. attwood 17720 Boat Seat Swivel. Boat seat swivel. Black powder coated. Folding Boat Seats (2). Boat Seats. Deluxe seats will suit any type of boat you may have. Sail Boat Awnings. Boat Seat Cover. Deluxe – folding seats White. Deluxe – folding seats Grey. 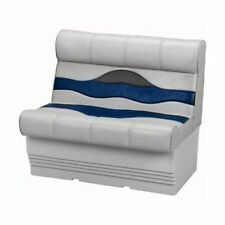 Deluxe – folding seats Blue/White. Boat seating products are practical accessories for boaters who need increased comfort during casual or sporting adventures. Many seat options are available, so you can easily upgrade a vessel so that the comfort solutions suit your specific boating needs. These seats have measurements that can fit contemporary and vintage boats. What seat designs are available? Bass: Boat seats with Bass design elements have plush padding that boosts comfort during long boating situations. 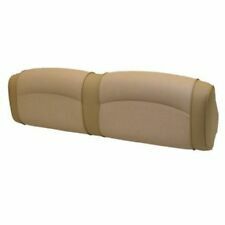 Bass boat seats are usually built with a two-tone fabric that blends well with the design scheme on a casual or sports boat. Folding: If you need a product that won't take up a lot of space, a folding boat seat is worth considering. 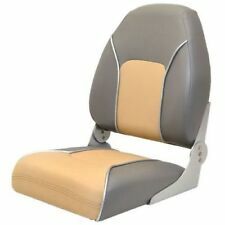 Folding seats also have thick, plush padding, and this material is attached to a special folding mechanism. Back to back: When a boat needs enough seating for multiple passengers, a back-to-back seat is an ideal option. This seat is designed with two seating zones, and the sleek design fits strategically on a typical boat with vintage or contemporary features. Pontoon: Pontoon seats are also sleek, as they're designed with stylish patterns that cover comfortable padding. These seats are practical options for a casual boat. Fishing: If your boat is mainly used for fishing trips, a fishing boat seat can be beneficial. This seat is built on a tall shaft that gives a boater an advantage and a higher vantage-point during fishing. What features does boat seating have? The swiveling mechanism helps strategic fishermen increase leverage when reeling. The swiveling mechanism rotates easily during tactical boating. Fishermen can pinpoint and target practical spots by rotating the swiveling mechanism. Are pedestal accessories for tactical boaters available? Many pedestal products that can increase the height of a boat seat are available, and these accessories give boaters a tactical advantage during strategic boating maneuvers. Boat pedestal gadgets are typically designed with power-rise components that help boaters make adjustments effectively and efficiently. A typical pedestal is 12.5 inches tall and is designed with a mounting pin.